The family name is derived from a Spanish phrase, “ve” meaning “to see” and “luz” meaning “light”. In the day when Filipinos were better versed in Spanish, the name was pronounced [ve’-luth]. However, its present-day pronounciation is [ve-luz’]. Though not yet confirmed, the original home of our Veluz line is said to be Luisiana, Laguna. However, Del Gallego, Camarines Sur is more reliably considered to be the family’s ancestral home town. Macario Veluz is the earliest known patriarch of our branch of the Veluz Clan. 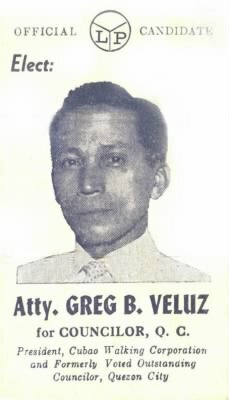 On December 09, 1918, Gregorio Balid Veluz was born from parents Florentina Balid and Jacinto Veluz in the small town of Del Gallego, Camarines Sur. 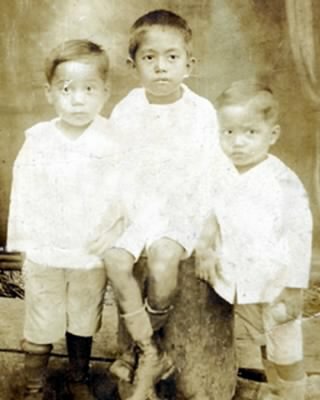 His siblings (all of whom are younger than him) Silverio, Antonio, Bienvenido, Pura and Angustia all looked up to him. Being a big brother, he was very protective of his brothers and sisters. 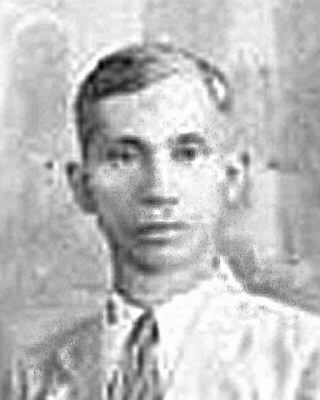 In his mid-twenties, Gregorio joined the Philippine Army during World War II. He was in the Infantry unit serving as a cannonball shooter. A deeply patriotic and nationalistic man, Gregorio fought fearlessly in the war. On 09 April 1942, Gregorio was captured along with thousands of his Filipino-American brothers and made to walk the infamous Bataan Death March. The march started in Bataan and ended in Capas, Tarlac. He was eventually held at Camp O’Donnell. On 06 June 1942, the Filipino soldiers were granted amnesty and released, while the American prisoners were moved to another camp in Cabanatuan. Gregorio’s mother, Florentina, redeemed her son (who was now ill with malaria) and together, went home to Del Gallego, Camarines Sur. After he fully recovered from malaria, Gregorio, brimming with youthful restlessness, searched for the guerilla forces in Bicol. At about the same time, the local Japanese troops stationed in Del Gallego appointed him as one of the baranggay tanods because they thought he would “sell-out” his country. His search eventually led him to the city of Naga where he obtained more information about other guerilla forces in Bicol. He then headed back home to Del Gallego where he was met by one of the town runners / watchers. The runner warned him that someone tipped the Japanese on his activities and that he must not enter the town, lest he be killed. With no clothes and only a small amount of money, Gregorio turned around and headed for his mother’s hometown in Minalabac, Camarines Sur. There he stayed with his mother’s relatives. Again, he began his search for more guerillas. This time, he found himself at the third district of Albay. He met Commander Montano Sabat and soon became his Adjutant. On their free time, the guerillas would sometimes go out in to town and hold social functions such as dance parties (one might wonder how the guerillas got away in throwing such parties with the Japanese nearby…well, they too, had watch guards). One particular party required those invited to dance the rigodon, a Spanish dance where those dancing meant they were part of the “who’s who” crowd. Little did Gregorio know that night, he would meet his future wife. 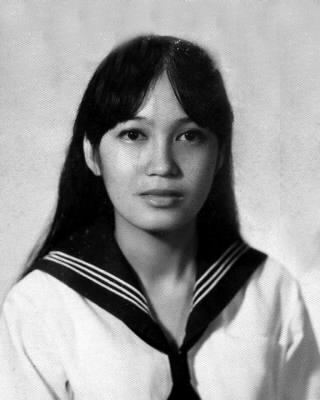 Angelina Calleja Serrano was relaxing at her home that evening when her older brother Ding invited her to the dance. At first, she refused but her brother’s constant nagging (and the fact that he didn’t have a date to the dance) soon worked and she found herself at the dance. As the night wore on, a certain policeman kept asking Angelina to meet his friend. She exclaimed that he must have the wrong lady for there were more than a dozen of them at the party. The policeman said to her that he couldn’t be mistaken for his friend said that the lady he fancied was wearing white, rabbit skin bakya’s. One of his helpers say Lina searching through the different pieces of shoes and asked her what she was looking for. Upon describing her shoes, the helper approached Gregorio and as both approached Lina, she saw that Gregorio was carrying her shoes (does Cinderella ring a bell? He later admitted that he hid her shoes because he knew she would look for it). And after that night, the magic began to unfold. The traditional way of courting began and their love for each other blossomed as time went by. 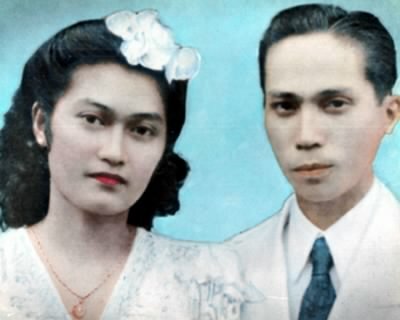 Finally , on November 24, 1946, Gregorio and Angelina tied the knot. 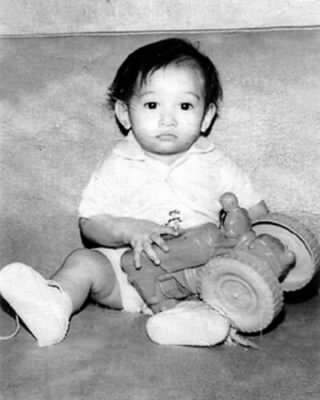 Then, in 1946, their son Ruben Jose was born. Greg, still an active guerilla trooper, was sent to Leyte with Commander Sabat to meet and inform General Douglas MacArthur about the positions of the guerilla forces in Bicol. 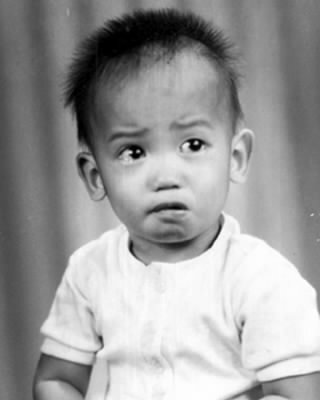 Two years later in 1948, Lina gave birth to Ramon; and in 1949, Edwin was born. Gregorio and his wife had seven more children after Edwin — Noemi (1951), Teresa (1953), Ana Marie (1956), Maria Linda (1957), Gregorio Junior (1959), Angustia (1962) and Melchor (1964). 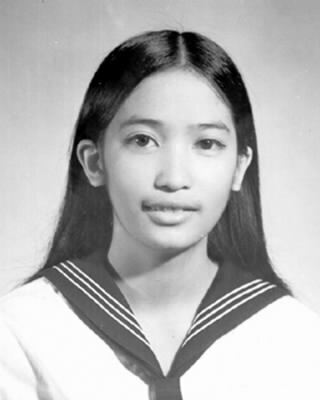 After World War II, Gregorio went to work at the Finance Department of the Armed Forces of the Philippines. 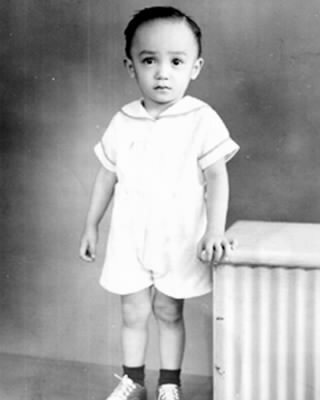 He then attended law school at the Manuel L. Quezon University and was accepted into the Integrated Bar of the Philippines on on 10 April 1953. 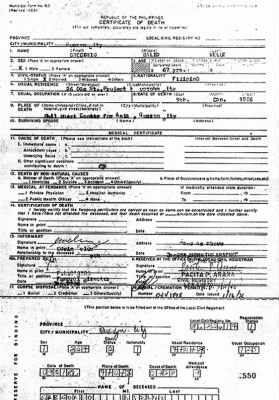 Later, he was tranferred to Military Intelligence. Goying became a military attorney under the Judge Advocate General’s Office (JAGO). 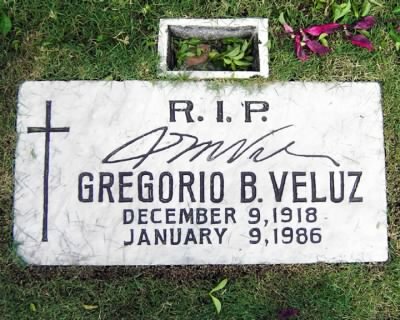 Gregorio was an excellent lawyer who covered all fields of law — criminal, labor, civil, appellate, among others. He was one of the founders of the Quezon City Bar Association and was an officer of the Integrated Bar of the Philippines. 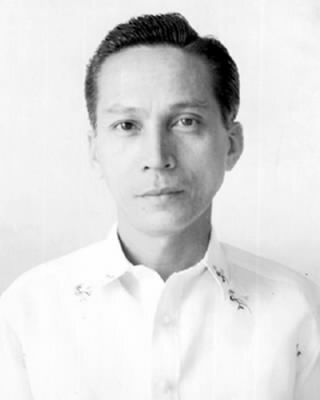 Gregorio was appointed Councilor of Quezon City in 1954 by President Magsaysay. His term lasted for 6 years; all of which he was awarded Most Outstanding Alderman. Gregorio’s role in politics became more prominent than ever as he became the campaign manager of the Nacionalista Party. 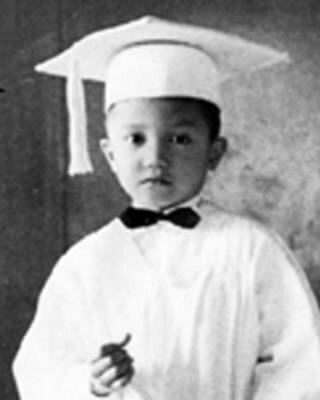 As Councilor of Quezon City, he saw to it that schools be erected so that all children may become educated. Due to his dedication, the Pura V. Kalaw Elementary School in Project 4 and the Quirino Public High School in Project 3 were established. He also made sure that a quality city hospital was nearby — thus, the development of the Quirino Memorial Hospital along Katipunan Avenue. Gregorio was also instrumental in the development of the Araneta Center in Cubao. 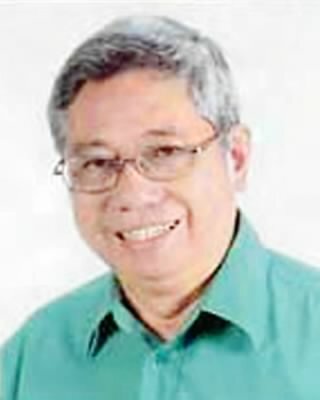 During the EDSA revolution, Francisco Sumulong wanted Gregorio to be a member of the Presidential Commission on Good Government (PCGG); but his time ran out. On 09 Jan 1986, he suffered a heart attack that claimed his life. He was only 67 years old. To close this biography, I hereby salute a man who is filled with honor and dignity — a man who knew where he stood and what he stood for — a man who did not let the poison of corruption enter his veins — a man who imparted all his perseverance, suffering and wisdom to his family — and most of all, a man who knew what legacy to leave behind — the legacy of love, honor and dignity. 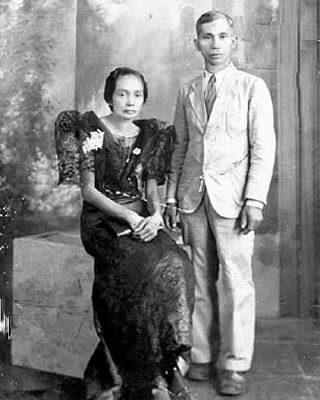 Jacinto Collantes Veluz (1890-1978) of Del Gallego, Camarines Sur, Philippines was the son of Macario Lucban Veluz and Cipriana Collantes. He accompanied his father during his trips to nearby towns to trade cows. In one of their visits to Minalabac, Camarines Sur, he and his father met and fancied the young, orphaned Florentina Padilla Balid who was living with her uncle, the local judge. It is said that after “reasonable” negotiations between the elders, Jacinto gained a bride in exchange for their livestock. Their union bore several children, with the first three dying in infancy. Among their children were Salvador, Gregorio, Silverio, Celestino, Antonio, Bienvenido, Angustia and Pura. 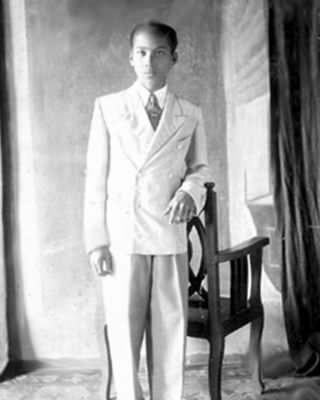 Macario Lucban Veluz of Luisiana, Laguna, Philippines is the earliest known patriarch of the Veluz Clan. Having fled his home town with his two brothers in the late 1800’s as an outlaw from the oppressive Spanish government, he and his siblings was said to have adopted this new surname which was befitting their new life (previous last name unknown). It is said that the brothers parted ways and settled in different towns in Camarines Sur and Camarines Norte. As his trade, he sold cows between Camarines Sur and Quezon. Eventually, he settled in a small coastal town Danawin in Quilbay, Camarines Sur — part of which is now known as a town of Del Gallego. He married Cipriana Collantes with whom he had several children: Simeon, Jacinto, Francisca, Cresenciano, Maria, Alejandro, Juana and Dolores.